Betty Edwards shut up shop at 11 am yesterday, ending her family’s 88-year history of keeping Rylstone up with the news. 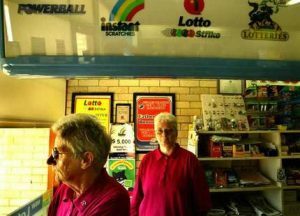 The newsagency wandered up and down Rylstone’s main drag, Louee Street, occupying five sites over the nine decades before Mrs Yarrington built her own shop in 1973. Over the years, the business diversified, adding a drapery, toys, books, records and anything else that was not available in the 15 or so other Louee Street establishments. Over the years, Rylstone’s town population stayed steady at about 800, with another 3000 living on properties in the area. Perhaps the biggest event to happen to the newsagency came a year after Mrs Yarrington’s death when Mrs Edwards opened an old shed that had been locked by her mother years before. It contained a sort of lost inventory of Mrs Yarrington’s business, including a copy of the first Phantom comic (went on sale September 9, 1948, price sixpence), a 1950s wind-up Japanese robot and a wind-up 1913 Zulu ostrich cart. Source: Sydney Morning Herald, newspaper article, http://www.smh.com.au/articles/2004/08/29/1093717838110.html, accessed 2 July 2016.